The gas inside the bearing gap leads to a natural compensation effect where shaft motion/rotation is more accurate than the sum of the errors of the involved parts actually allow. Thus air bearing spindles allow asynchonous errors in motion of less than 10 nm where roller bearings only allow error motions of 100 nm and more. For the user this means achievable surface finishes of only a few Nanometers Ra, which are crucial for optical components or molds for such. In customer applications our ASD060H25 has in fact achieved Ra values of less than 3 nm. Please contact us for details. Shear velocities of 200 m/s or more in journal bearings and 450 m/s or more in thrust bearings are standard in high-speed air bearing spindles. Whereas in roller bearings the roller elements limit the shaft speed, in aerostatic bearing spindles only centrifugal load and rotordynamic instabilities set limits and outperform roller bearing spindles by about factor 2. Thus air bearing spindles offer larger shaft diameters than roller bearings spindles can do and thus our ASD-H25 with HSK-E25 tool interface can be offered for spindle speeds of up to 100.000 rpm. When oller bearing spindles are operated at high speed for a long time their bearings run dry, become hot and begin to degenerate. Thermal distortion, dropping accuracies and even failure are only a few consequences. High-Speed Applications with machining times of hours to weeks are becoming more and more important for precision parts with small features and/or high standards on surface finish. For such an application Aerostatic Spindles are the perfect solution as they don´t change their thermal or dynamic behavior at all once they’ve warmed through (within minutes) and can be used without any time limit at high speed. While with roller bearing spindles the bearing cage limits the time to ramp up and down a spindle no such limit exists for well degined aerostatic spindles and only the maximum motor current defines the ramp times. Our ASD080H25 for example is able to ramp up to 80.000 rpm within 1.5 seconds and back down to 0 rpm in the same period. Before a roller bearing spindle can be used a couple of minutes are requried to lubricate the bearings and to distribute the grease within the bearing. After the bearing supply air, the chiller and the drive have been switched on an Aerostatic Spindle can be used right away even at top speed. 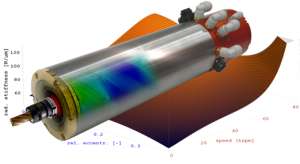 Thermal shaft growth of 50-100 µm are common for roller bearing spindles. Due to the cartridge design and the highly efficient thin-film liquid cooling of our ASD060H25 it shows a change in shaft length at the spindle nose of only 3 micron. For most applications no compensation is required which means both, safer as well as more economical operation. Although an Aerostatic Spindle has a comparable ultimate load capacity a roller bearing spindle’s reaction to overloading it are bearing noise, higher bearing temperatures and dropping accuracies where a shaft of an air bearing spindle is likely to seize if overloaded. The simple and logic design of air bearing spindles – especially with Levicron´s modular cartridge system – on the other hand enables a front bearing exchange within minutes while the spindle can remain in the machine. A roller bearing spindle on the other hand requires a very time consuming revision at the spindle manufacturer site. 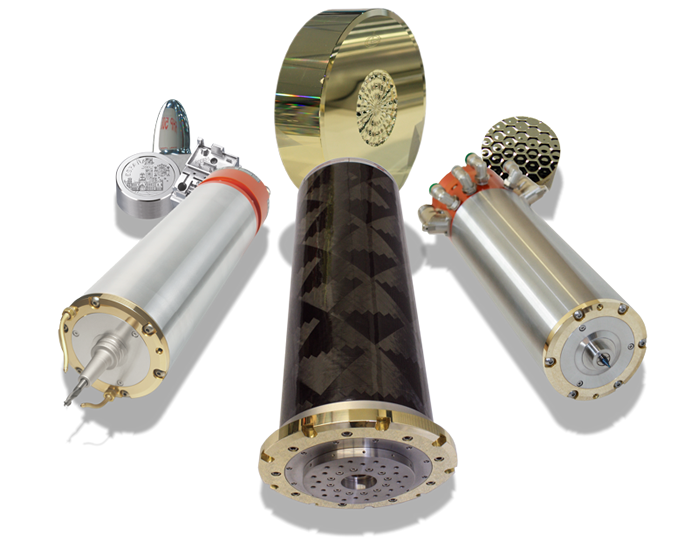 No grease, no oil, no wear – these facts make an Aerostatic Spindle maintenance free if used in its specified range and even allow its use in gaseous environments, in clean room conditions and/or the food industry. For an operation in a gas atmosphere other than air, like CO2 e.g., the gas itself can/should be used as a bearing medium. Meanwhile the use of hybrid roller bearings with ceramic balls are common to overcome thermal issues, ball wear and to increase accuracy and spindle speed. However such bearings require anti-static devices like brushes to avoid electrical light bow discharge through the tool into the work piece. Due to the massive aerea and the small gaps between air bearings and the shaft and the so resulting capacitor no such devices are required for Aerostatic Spindles as electrostatic charges get continuously discharged through the bearing gap (without any light bow). Tool changing systems – especially when springs are involved – require several thousands of Newtons to eject a tool. Thus roller bearing spindles are equipped with quite complicated restraint systems to absorb these loads to prevent the bearings from getting damaged. 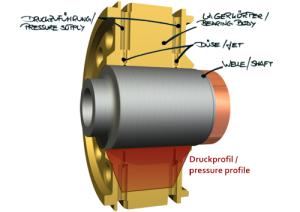 With Aerostatic Spindles the aerea of the thrust bearing is that large and flat that the thrust plate of the shaft just settles snugly onto the bearing with small contact pressure. By using tool clamping systems with no springs Levicron was able to lower even this load by 60% as when ejecting a tool the involved force doesn’t have to overcome the spring load which normally pre-loads and restrains the tool holder in the spindle taper. Why Aerostatic Spindle Solution from Levicron? Levicron has consequently applied and improved the points listed above. Beside this the performance as well as the robustness of our products are the most important design focus to offer industrial high performance air bearing spindles to our customers. While most of the air bearing spindle manufacturer don´t have or simply avoid the high standard in manufacturing required to produce high performance air bearigns and just offer air bearing spindle with low stiffness and load capacity we at Levicron used all of our expertise and knowledge to set up a production dedicated to manufacture air bearing products and to create robust as well as high performance air bearing spindles. Moreover the use of springless HSK tool clamping systems removes any issue with spings and improves spindle dynamics and reliability. Thus Spindles from Levicron are not just modified or derived Printed Circuit Board Drilling Spindles – as ususal -, but industrial high performance spindles decifically designed for precision-, micro- and ultra precison CNC milling and grinding. Air Bearings as a possible replacement for Roller Bearings? They are indeed! Even for modern engineers aerostatic bearings often are an unknown and less load capacity as well as a lower stiffness are the mentioned reasons because of the absence of any metal-to-metal contact. But considering the huge bearing area of an air bearing compared to the tiny hertzian point contact of a roller bearing it should become obvious that air bearings – if properly designed and optimized – can even compete with roller bearings with respect to load capacity and stiffness. Only at overload they can respond with shaft seizure. Where on the other hand swapping bearings just take minutes while the spindle can remain on the machine it normally last weeks to repair a roller bearing spindle. As there is no need for grease or oil-air lubrication the air bearing construction is simple and allows a completely dry operation.